Your future system starts here – our May 2014 issue is on sale now | What Hi-Fi? 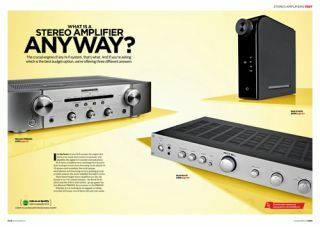 From turntables to tablets, if you're looking for an amazing amplifier capable of handling them all, let May 2014 issue of What Hi-Fi? Sound and Vision be your inspiration. We've cast our eye over three stereo heroes from £300 that'll sit at the heart of your hi-fi system, and we've got an amp to suit everyone's needs, including two Award-winners. But that's not all. The latest issue – now available in print and online – has more exclusive reviews in store, with this month's First Tests including Sony's flagship Full HD TV. Q Acoustics' Concept 40 stereo speakers and the Yamaha RX-S600 AV receiver also feature among the latest products to make their first appearance in our testing rooms. Our Supertest sees seven phablets from the likes of HTC, LG and Samsung go head-to-head in a bid to see which is the one that best combines its smartphone and tablet roles. Phablets aim to give you extra screen inches for watching videos and web browsing, while remaining portable enough to carry around. Find out which one you should consider. And that's still not all – seven Bluetooth DACs up to £100 are put to the test; we cast our eye over four soundbars for your TV; and our Temptations promise to entice you as usual. Pop along to your newsagent and pick up the May 2014 copy of What Hi-Fi? Sound and Vision today. Alternatively, download the mag straight to your iPad or buy a single copy online.